Normally, blood flows from arteries to veins through a network of fine capillaries that slow the force of the blood back to the heart (left). In a baby with a vein of Galen malformation (right), the capillaries are missing. The resulting force on the veins and heart can lead to heart failure. A vein of Galen malformation (VOGM) is a rare but particularly serious type of arteriovenous malformation (AVM) that develops before birth and is diagnosed in infants and young children. It affects the “great cerebral vein,” also known as the vein of Galen, which is one of the large veins that returns blood from the brain to the heart. The condition is sometimes referred to as a vein of Galen aneurysmal malformation (VGAM). A vein of Galen malformation can be fatal, but the prognosis has greatly improved with newer endovascular techniques performed by highly trained experts. Like other AVMs, a vein of Galen malformation is an abnormal tangle of blood vessels that disrupts the usual flow of blood. 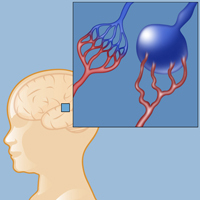 In a patient with a vein of Galen malformation, some of the tiny capillaries that normally distribute oxygen-rich blood throughout the brain are missing. Since those capillaries intercept blood coming in from an artery and slow down the flow of blood back to the heart, when they’re missing or malformed the blood rushes into the vein of Galen with too much force and little resistance to flow. This relative lack of resistance sometimes leads to overworking of the heart, with the potential of heart failure. The increased blood flow into the veins can also disrupt the normal balance between cerebrospinal fluid (CSF) production and absorption, resulting in hydrocephalus. Other complications might include brain dysfunction, with developmental delay, spontaneous bleeding in the brain, or seizures. When a vein of Galen malformation is apparent on a prenatal ultrasound or at birth, the condition is usually more serious and has a higher likelihood of heart failure. Older babies and children found to have the condition have a more optimistic prognosis, with mild or moderate neurological impairment and manageable symptoms. What Causes a Vein of Galen Malformation? Reviewed by: Athos Patsalides, M.D.